The Hoover FH50150 Power Scrub Deluxe Carpet Washer sold extremely well and is one of the most popular carpet cleaners you can find. I bought it 1 year ago on Amazon and must say it is amazing. Since I have little kids and a dog, my carpets are in constant danger. There isn’t a day without a new stain on the rugs and carpets. This requires regular maintenance, which without a carpet washer can be exhausting. 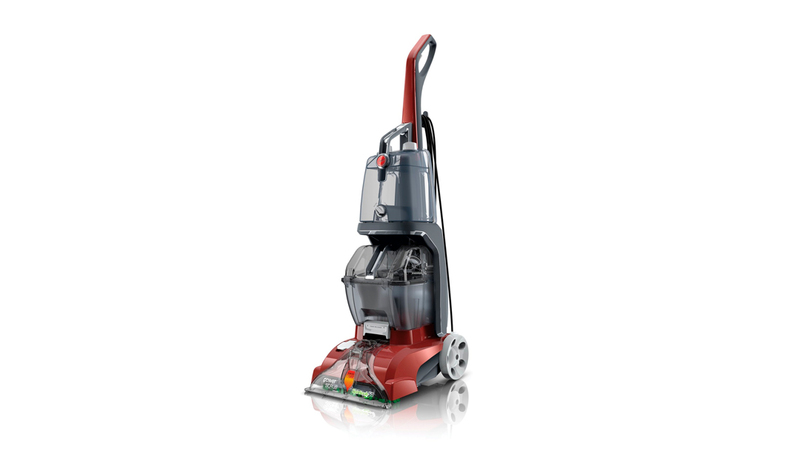 In this article, I will present you my Hoover power scrub deluxe carpet washer review. 3 How does it perform? Before the purchase, I read that Hoover manufactures one of the best carpet cleaners on the market. The Hoover Power Scrub is certainly no exception. Once you open the box you will notice that it is very easy to assemble and it takes less than 5 minutes. In the box, you can find a variety of tools (SpinScrub Powered Hand Tool, Stair tool, Upholstery Tool, and Crevice Tool) that will help you clean. One of the most useful is the turbo brush and it is used to scrub the stairs, your car floors, or any hard to reach places. You can also find medium and large suction tools very useful for sucking up spills from the carpet. One very nice feature is the Mesh Tool Storage Bag to store all the tools that come with the machine. Last but not least there is a bottle of Hoover carpet cleaner and deodorizer, so you can start right away. Nice touch Hoover! Looking for a cheap vacuum for your home? Here are our top 5 choices. 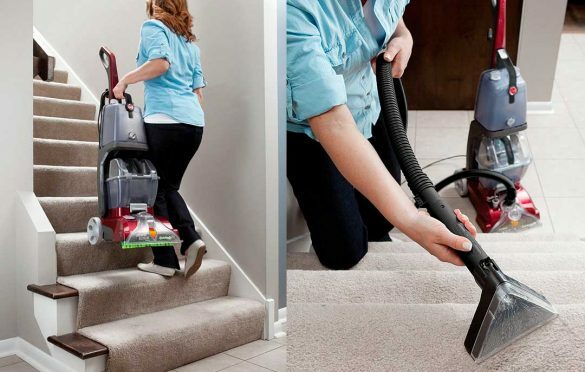 The cleaner is easy to maneuver due to the lightweight (less than 19 pounds). The power chord is 20 foot long and the hose is 8 feet which allows you to move freely around the carpets. It is very easy to assemble. All you need is a screwdriver. I recommend using the Phillips screwdriver. You just have to screw the handle on the body and then snap the clean water tank above the tank for dirty water, which is already installed. Both water tanks are easily manageable. Filling and emptying is easy and doesn’t make a mess. The clean water tank has two separate openings to fill it with water and cleaning solution. It can hold a good amount of water and cleaner so you don’t need to fill it up every few minutes. On the sides, you can notice filling lines so you won’t overfill the tank. The tank for dirty water comes with a quick pour opening located on the handle. One of the coolest things is the heated cleaning. It directly applies hot air to the carpets to help remove the tough stains and save you a lot of time on drying. It even helped me remove rust from my carpets. The nozzle provides equal and strong suction. Now the part that you are most excited about. Does it really clean? With each pass onto the carpet, you can immediately see how well it works. You can notice by the dirt gathered in the dirt tank. The only thing I found annoying is that sometimes it sprayed unevenly. But since it cleans so well this is something I can live with. I read somewhere that in order to get the best out of this cleaner is to run it on the carpet just with water in the tank. It will help dump the carpet so it absorbs the cleaning solution better. This is probably the case with every cleaner. After I started doing so, I noticed the end result is even better. In the end, I have to say I am very happy with the cleaner. It does its job so well. It comes with a 2-year warranty as well as a great support system with online tutorials, phone, and email support if you have questions or issues with the product. You can check the current price on Amazon via this link. You can also read about the best cleaners for pet urine on this post.